How to use Facebook Groups to grow your business. Before I launched my business, I hated using Facebook for advertising. In fact, as a social media marketer, FB wasn’t even part of my social media plan, I focused on Twitter (read about twitter chats here), and Pinterest. Why? I’ve heard horror stories about how horrible Facebook’s Algorithm was and how you had to spend money on Ads to get your content seen. 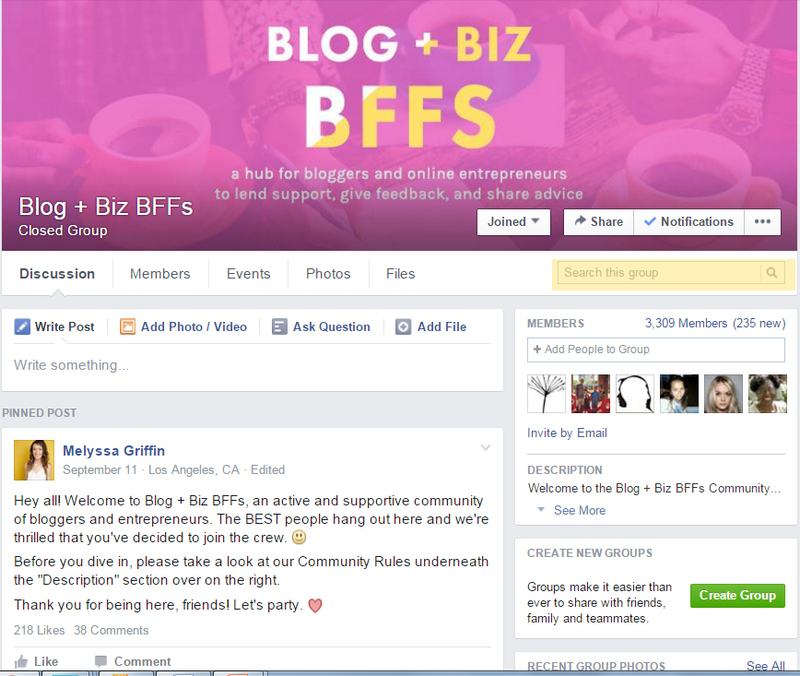 I knew the importance of Facebook groups though, but it never applied to me since I was stuck in a weird limbo - my business hadn’t launched yet and I didn’t have any blog posts to share. So, I was mainly using Facebook groups to gather content and learn from other bloggers + since I’m a ecourse junkie, I would scour facebook groups to see if anyone was raving about any courses they had previously taken. I remember asking my bloggie bestie Vanessa how she had so many clients before she even officially launched her blog. “Facebook groups, be helpful and people will see your blog + be interested in what you have to offer.” But, it didn’t hit me. How could you get readers from a Facebook group? How do you get clients from participating in threads? And most of all, how do you market yourself? If those are questions that are going through your head as you’re reading this… you’re in luck. Here's how to promote your business on FB for FREE. 1. Be extremely helpful, so helpful they can’t ignore you. This is key. No one wants someone who just randomly throws their blog link in a thread and leave. If you see someone asking for help, and you know the answer, help them. You’ll find plenty of people to connect with this way, and if you’re using FB correctly (meaning you are linking your business in your profile) then they might get curious and click to see your blog. How this helped my business: I noticed people began asking for advice on their blog design and readability. So, I replied to a comment telling the poster what I thought about their blog and also said, “If anyone wants me to review their blog as well, visit my contact page at diana@thecoffee.com and I’ll review your blog.” I got 5 submissions, not only does that bring traffic to my site, I also got to review those bloggers website and offer them my services at the end! 2. Drop your link strategically. What does strategically mean? This means that if you’re browsing a FB group and someone has a question that you answered in a post then leave your link. Make sure you offer something helpful first or even a summary of your post. Don’t leave your random blog link in a post that is completely random, no one wants to hear about your Facebook tutorials in a Twitter Help Thread. Look at how much engagement that got. I got so much traffic from just uploading my blog post and answering someone's question. Here's an advanced tip for you! Now, if you’re starting out like me then it should be no problem to compile your posts and start organizing them. If you have been blogging for a while, then look to see which your most popular posts are and enter them into this spreadsheet. When someone asks for advice and if you think you have a post that could help them, Search for the tag and gather the link for them! Here's an example of mine! 3. Engage in promo threads, all of them. I love promo threads, It gives me an opportunity to support fellow bloggers and also promote my own. I remember reading a post on another FB group where a bunch of bloggers complained that promo threads were useless because there were too many people posting at once. I believed that… for 15 minutes until I submitted my own post and got 2 blog design inquiries. For others, it might be a hit or miss. I think it depends on the time that you submit your promo (if it's super busy and at a peak time then your promo might be hidden), or the copy. So, what are people doing wrong? The Key: What you write in your promo is super important, spend some time crafting it - making sure it speaks to your target audience. Give a snippet to what that post is about, or what it is that you do. Most of the time, people just throw their link into the comments which doesn’t show anyone what the post is about (Aside from the title) and that never captures anyone’s attention. Write something about your post, give a little preview, or tell people about your business. - I'm a designer for bloggers on a budget. My prices are ______________, ________________ , _______________. The reason I like to list prices is that some people are too lazy to click on your link and see what your prices are. If your target audience is bloggers on a budget and they see that they can afford your prices, they will be more likely to reach out to you. -Want to grow your twitter following? Check out this HUGE GUIDE I wrote on how to increase your followers using Twitter Chats. The Number 1 Rule: BE CREATIVE & BE INTERESTING. 4. Post a photo and not a just a link. This was something I picked up in the threads & something that a lot of people are not using to their advantage. Having the opportunity to post up a photo instead of a link is HUGE. Your photo will appear larger and more eye-catching. & it just takes a few seconds. TIP: JUST USE YOUR PINTEREST PHOTO THAT YOU MADE FOR YOUR POST. 5. Use the search feature to find threads to post in! Many people don't know about this feature and once they learn about it... they'll never stop using it. In order to get the most out of Facebook Groups, you have to constantly be looking for threads to post in and for people to help. This will make it so much easier for you. Trust me. Step 1: Go to your favorite blog group and click on SEARCH THIS GROUP. It's located at the TOP RIGHT hand corner. Step 2: Type in what you want, so I could type in "Twitter Chats" and I would find threads where people mentioned Twitter Chats. Use this to your advantage. Read over the threads, if anyone has a question that you answered in a blog post, post your link! That's all for now! I'll be sending out a checklist just for my newsletter subscribers sometime this week, if you want to get on the list then don't forget to sign up HERE. Also, I'll be adding in a video sometime soon as well with a walk through for all the technical stuff. You don't want to miss this! Leave a comment and tell me if you've had success using Facebook Groups to your advantage. Also, tell me what groups you love!